Social media marketing is one of the core areas businesses should perform well to be relevant in a vastly changing digital marketing landscape. However, not every social media platform holds the same area of importance. That's why you have to take the time to understand what medium will fit well for your business. For instance, Facebook ‒the world's most extensive social network, had been an attractive online marketing platform for most brands and businesses. Many have come to appreciate it for its multitude of features, use, and constant innovation. At the fourth quarter of 2018, the number of active monthly users on the platform rose to 2.32 billion. That's nearly 30% of every single person on Earth! Moreover, according to the platform's own published stats, an average user spends approximately 55 minutes a day here. That's an excellent opportunity for your business to grab customer attention. There's no doubt that Facebook continues to rise above other social media sites. It also became more than just a platform for meeting friends, and instead, transformed itself into a venue for brands and businesses to market themselves through self-promotion and interaction with potential customers. Whether you're just starting, or you have already built a sizable amount of followers, setting up a Facebook account is free, making it a low-cost marketing strategy. Other marketing strategies such as traditional advertising would cost you thousands of dollars. However, through Facebook, it will just cost you a fraction. That's why it's so ideal for small to medium businesses who only have limited budgets. Bigger businesses can also do a trial marketing campaign or theme on Facebook before completely committing to larger campaigns. Not only does the platform allow you to post texts and images, but it also lets you upload videos for your business a well. Videos have a powerful way of communicating with customers like words can't. It also makes them see your products and services without having to visit your website or physical store. If people find your video ad interesting and valuable, then, they’ll share it to their own network of friends, family, and acquaintances. As a result, this will increase the exposure of your video exponentially. Aside from that, videos can convey large amounts of information in just a short period, and more engaging with one's senses. Therefore it can communicate information effectively, through showing and telling. You've probably noticed how video marketing has dominated a majority of Facebook's newsfeed. Well, that's because most people would prefer watching videos than reading content. The platform allows you to create video ads to grab more attention. It's possible for Facebook to analyze the millions of information users enter on their profiles. That's why, as a brand or a business, you can pay to use this information to target a specific group of users. For instance, a women's clothing company can use Facebook to know how many users of a certain age, and in a specific city has listed 'fashion' as their interest. Afterward, they can create compelling ads that specifically appear to those users. In its most basic form, remarketing is a kind of technology wherein the ads that you create for your business are shown to people after they visited your site, used or app, or gave their email address. Then, most likely, they would come across these ads again when visiting other websites, watch videos, use Google, utilize other mobile apps, or use social media. Facebook retargeting is one of the most powerful ways to grow your business. You can utilize this for your hard offers such as consultations, downloads, and sign-ups. If you run a retail business, you can even integrate remarketing with Facebook product ads. The platform makes it convenient to set up ads guiding you when it comes to choosing the ad type, defining your audience, and creating your budget and timeframe. Aside from the whole process being straightforward, it's also customizable. You can choose different ad formats, bidding, and delivery options. For example, Facebook uses the pay-per-click (PPC) model just like most online ads. But, there are also other options such as pay per like, pay per click and pay per action. Advertising on Facebook lets you reach people when they're still not in the buying frame of mind yet. However, rather than seeing it as a disappointment, you can view this as an opportunity to promote your brand. While some of your ads can be ineffective in making a sale, they can be valuable in nurturing leads and boosting brand awareness. Now, this can make measuring your ads more complex. However, Facebook streamlines the entire process giving you valuable insights that are related to your goals. Many of these insights are about your social ROI ‒ how your audience reacts to your ads. For instance, aside from the data related to your overall reach, impressions, and frequency, you'll also receive insights about your click-through rates, page likes, comments, shares, etc. These metrics are collected in real time, letting you make changes to your ads when necessary. Facebook is the number one social platform used by most brands and businesses. With billions of active users each month, it isn't hard to imagine why a lot of companies, no matter how big or small, has picked it as a way of engaging and interacting with their followers. The platform isn't a new tool and yet it's something that others mostly underutilize. So hopefully, these tips that we have provided you will help you learn valuable insights along the way. Also, working with best Facebook advertising agencies will help you step up your Facebook marketing game, capitalize on your existing marketing pull, and reach a broader customer base in the long run. 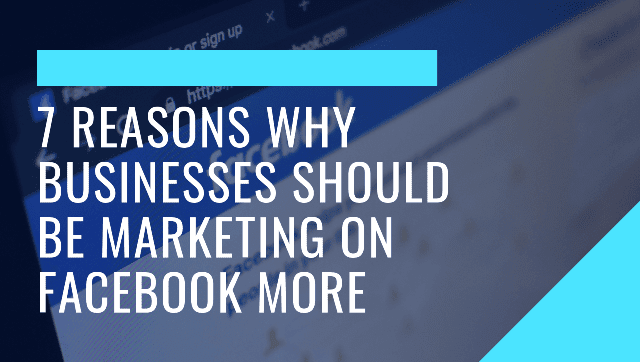 I hope you enjoyed this blog post about the reasons why businesses should be utilizing more Facebook advertising for social selling. Interested in more articles about Facebook marketing and advertising?